During periods of thaw, soil, rocks, small plants, and gases are released from their frozen pockets of ice. Envision water bodies, forests, bogs, streams and ocean ecosystems now receiving thawing water laden with soil and dissolved nutrients; carbon, nitrogen, and other dissolved nutrients are released which organisms use and breathe as additional heat-trapping gases into the atmosphere. Like a sponge, permafrost landscapes have absorbed and released carbon and nutrients during repeated climate swings. Today, the sponge is being squeezed by dramatic warming of northern latitudes, at a rate that is unprecedented for at least 3 million years. In the next 50 years, as arctic systems warm, the release of carbon and nitrogen in permafrost could greatly exacerbate the warming phenomenon. Thawing is impacting ecosystems on land and offshore according to USGS scientists and their collaborators. The U.S. Geological Survey contributes to several science networks dedicated to detecting and understanding permafrost, its degradation in a warming climate, and its impacts on ecosystems and society. Time series of observations are the focus of several networks such as the Real-Time Permafrost and Climate Monitoring Network in Arctic Alaska, Circumpolar Active Layer Monitoring (CALM), borehole temperature monitoring, and ecosystem assessments. Meanwhile, spatial surveys are used to develop an understanding of complex processes involved in permafrost formation and degradation, and permafrost cores are used to understand the timing of permafrost formation and degradation on longer timescales. Ultimately and in tandem with computer modeling, the measurements of ice, water, carbon, and biology fundamentally improve our assessments of arctic change. 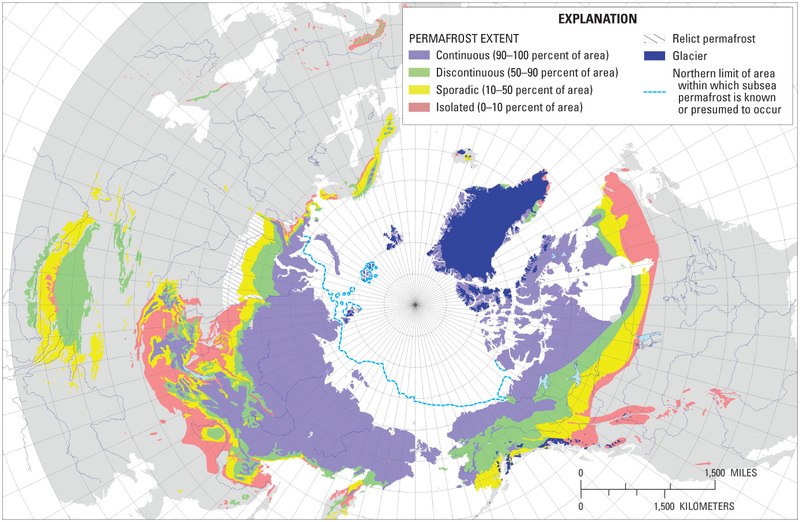 Permafrost is primarily found where average annual air temperatures remain below freezing. In the Northern Hemisphere such locations include Scandinavia, Siberia, Tibet, Alaska, and Canada. Permafrost can also be found in alpine areas in the Northern and Southern Hemispheres, such as in Patagonia in Chile and the Southern Alps in New Zealand. Indeed Mauna Kea, Hawaii, which is considered to be an Alpine desert since the area is exceptionally dry with seasonal snow cover, is underlain by permafrost. 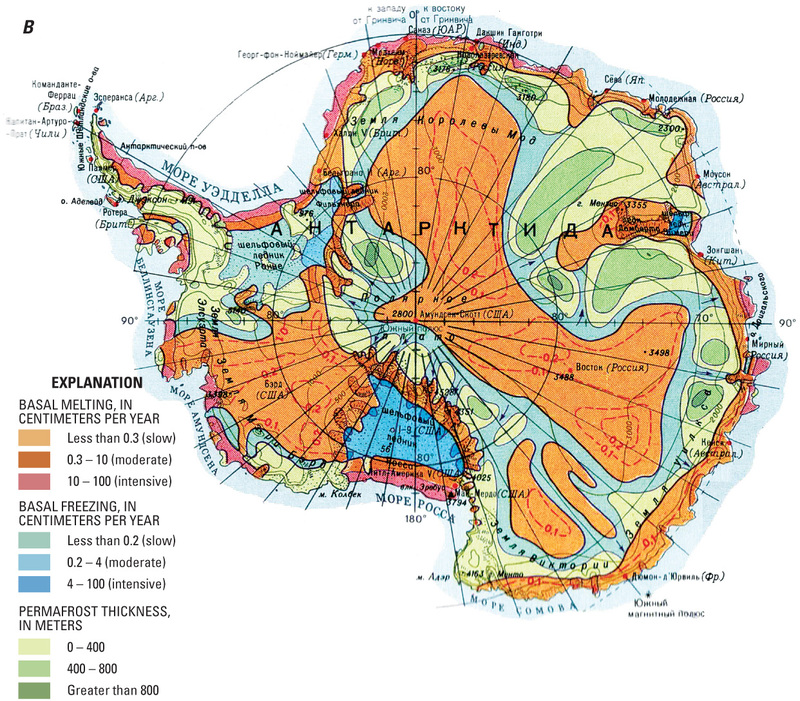 Antarctica does not have much permafrost because there is so little exposed land, as most of the land in Antarctica is covered by the massive Antarctic ice sheet. Periods of warming in the Arctic cause permafrost to degrade. As permafrost thaws, large amounts of carbon and nitrogen are subjected to decomposer organisms in the warming soil. Potentially huge amounts of carbon dioxide and methane are released into the atmosphere, and these gases in turn exacerbate the warming climate because of their greenhouse effect in the upper atmosphere. This is why climate scientists are particularly concerned about northern latitudes and the permafrost that lies beneath. The USGS uses carbon comparisons between past climate cycles and recent warming trends; between wildfires and unburned landscapes; between wetter and drier conditions; and younger to older thaw histories, all to help build a picture of how ecosystems and the atmosphere are likely to respond in a permafrost-free future. Fieldwork, laboratory settings, and computer models are tools used to better understand the complexities of climate science. Permafrost thaw also impacts terrestrial and aquatic ecosystems because of the wholesale changes in ice distribution, surface water, sediment, groundwater, plants and animals. Across the Arctic, entire ecosystems are reorganizing to adjust to these shifts in water, nutrients and carbon. Habitats needed for feeding and nesting are forcing changes on wildlife. Planners are facing challenges related to shifting ground during thaw; erosion of sediment into reservoirs; and highways that have fewer days when frozen soils can support transportation without costly damage. USGS is helping anticipate these impacts by surveys and inventories of ecosystems and their components. People often refer to land providing resources, and should think of permafrost in the same light. Permafrost landscapes are important because they provide local “services” such as food (wildlife, berries, agriculture) and fiber (e.g. wood) but these landscapes also regulate Earth’s atmosphere by storing and sequestering carbon dioxide. Learn more about these important services and how they are likely to change over the coming decades by studying USGS science.